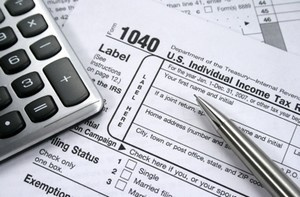 BGGE Tax Service | A proactive approach to tax preparation. BGGE Tax Service takes a proactive vs. reactive approach to tax preparation. By keeping current on new tax laws and legislation, as well as my 30+ years taxation expertise and knowledge, I help clients organize their financial data in a way to satisfy the governmental record keeping requirements before a tax return is ever filed. Actually, a component of BGGE Bookkeeping Service, the tax-related work I perform is not designed to replace your current CPA or income tax preparer. Instead, I will work with your accounting professional throughout the year to ensure that your books are tax-ready. If you do not have a CPA, I will compute your monthly or quarterly taxes for the forms needed to operate your sole-proprietorship to avoid paying paying penalties at income tax time. Many local, county, and state agencies are moving away from paper forms. I offer electronic submission services. And at income tax time, I will review the deductions you want to claim to ensure that you have the necessary documentation to support the claims you plan to submit to your preparer or governmental agency. An “itemization documentation specialist”, I help clients submit accurate returns while attaining the lowest tax liability that’s legally possible. The IRS will begin to process tax returns on Monday, January 23, 2017. Tax returns claiming Earned Income Tax Credit (EITC) and/or the Additional Child Tax Credit (ACTC) will not be processed until February 15th. Need to filed an extension this year? October 18th is the last day to file your tax return.